This monograph is not confined to mechanical twinning in the narrow sense (lattice reorientation in re­ sponse to mechanical stress); it deals also with many effects related to mechanical twinning. such as formation of reoriented regions in response to high temperatures (martensite transformations. recrystallization twins). elec­ tric fields (ferroelectric domains). and magnetiC fields (magnetic domains). Mechanical reorientation is discussed for classical twinning and also for an inhomogeneous distribution of residual stresses (irrational twinning. kinking. and so on). Mechanical twinning in the narrow sense (regular. symmetrical lattice reorientation in response to me­ chanical stress) was for many years a specialist topic for mineralogists. petrographers. and crystallographers. Mineralogists and crystallographers carried out the study of the basic geometrical relationships in twinning; the principal names here are MUgge, Niggli. Johnsen. Reusch. Baumhauer. Churchman. Wallerant. Evans. and FriedeL The laws of mechanical twinning are now widely used in mineral identification and in elucidating the conditions of formation of rocks from the minerals they contain. The distribution of the twin bands in rock­ forming minerals enables one to establish the later processes that have occurred in the rock. Mechanical twinning is discussed by geOlogiSts and petrologists in the analYSis of flow effects. 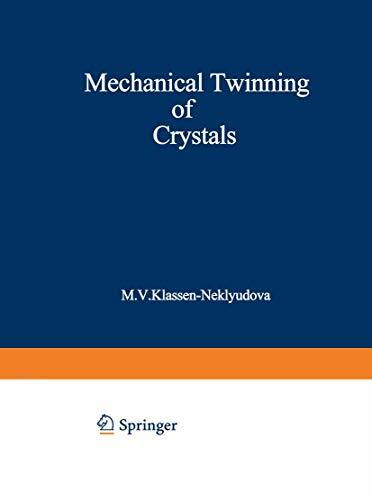 The importance of mechanical twinning in the plastic deformation and rupture of crystalline solids was W stressed by Academician V. I. Vernadskii in 1897 and by Kirpicheva ina paper entitled WFatigue in Metals in 1914.